Great Colt, I have only shot it at 100 yards with open sights. Very accurate!! I have added a lot of extras since new. After months of sitting idle my Colt M4 had finally had baptism of fire today and it worked perfectly. It was the first time my two young sons shot a high powered rifle and they loved it. This is my first AR 15 and this colt has been fantastic. While I have less than 200 rounds through it so far, it has run without a problem. I have since put a Trijicon MRO with a Larue mount to keep it a light weight firearm. The transaction went smoothly as usual, as this is my third purchase with them. If you have been considering an AR 15 get it soon, Colt's or not. This is my first AR 15 and this Colt has been fantastic. While I have less than 200 rounds through it so far, it has run without a problem. I have since put a Trijicon MRO with a Larue mount to keep it a light weight firearm. The transaction went smoothly as usual, this is my third purchase with them. If you have been considering an AR 15 you may want to get it soon, Colt's or not. This is my first AR 15 and this Colt has been fantastic. While I have less than 200 rounds through it so far, it has run without a problem. I have since added a Trijicon MRO with a Larue mount to keep it a light weight rifle. The transaction went smoothly as usual, this is my third purchase with them. If you have been considering an AR 15 you may want to get it soon, Colt's or not. great gun , flawless transaction . glad i got in before the "scare" . colt quality , colt function . you cant go wrong with a colt and grab-a-gun . Great customer service, fast delivery. I’ve owned several Colt platforms including caring a M-16 for 9 years the US Military. In my opinion Colt builds a quality product, true Mil-Spec. The only issue I had with this purchase is the shipper UPS beat the hell out of the box. There was some small marring on the barrel and upper, no biggie though. I guess maybe better packing prior to shipping. All in all, 5 Stars for Colt and Grab a Gun..
Great deal, great shipping. Ordered on Sunday had it in my hands Friday afternoon. The is my second firearm purchase from GAG; I won't shop anywhere else. What a great deal on the gold standard! Wish I had bought two at that price! Will definitely buy from again, with $5.99 shipping, the price just can't be beat! Thanks! Purchased the M4 in the late evening and grabagun shipped it out the next day. Received the rifle in 3 days!!! Can't beat the price of other stores and shipped it out faster then any other online retailer that I've purchased from. Would definitely do business with them again and very happy with the performance of the LE6920. Love the feel, love the look, and love the accuracy! There is really nothing I can say about a Colt 6920 that hasn't already been said. It shoots when you pull the trigger (every time) and is more accurate than most shooters, A far as Grabagun goes, I ordered the Colt on 2/19 and it arrived on 2/25 in perfect condition and at about $75 to $100 less than everyone else, what more could you want! Excellent deal and fast shipment. Hate to say it but Buds, you just lost a customer. I didn't even need to buy a VIP membership with GrabAGun. I am thrilled with the le6920. Maybe you can buy better but you'll pay much more. My only complaint is grab a guns customer service. Why can't you give us credit for the 30 round mags. It's bad enough the state of Colorado is screwing us- but shame on grab a gun for taking advantage of us. Well, I hesitated and now the 6920 is out of stock. Dang. Awesome price. I already own 1 LE6920 and it is the typical Colt firearm, superb. I'll keep watching this and if the price repeats at $930, I'll jump on it quickly. Everything is Great can't wait to do some add on's! Prices are taking our country down! This specially designed law enforcement weapon system features many of the combat proven advantages of the military M4. With the 4-position buttstock fully retracted, the Law Enforcement Carbine is less than 30 in (76.2 cm) in length and weighs only 5.65 lb (2.56 kg) - ideal for tactical deployment and traditional patrol. Colt's Law Enforcement Carbine is available with a step-cut barrel that allows it to accept a grenade launcher for non-lethal options. Furthermore, the handguard has dual insulated aluminum shielding for more effective heat protection. 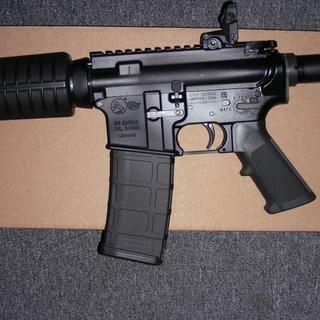 The Colt Firearms M4 Carbine 5.56 16-inch Black is quite an interesting and highly effective model to consider adding to your current gun collection. It offers many features incorporated into its design that make it more comfortable and easier to shoot. It is popular in combat style scenarios and can easily get the job done. Among the features, you will enjoy a step cut barrel which will accommodate the addition of a grenade launcher. There are also hand guard applications that have dual insulated aluminum features for more effective shielding from heat due to the discharging of the weapon. Be the leader of the pack with this firearm.